Not strictly Tube related but because I use Richmond Station a lot, it was great receiving an email from Simon Hickman from English Heritage with the following pictures. 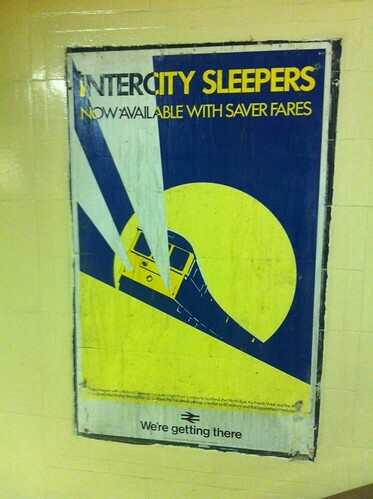 He said "South West Trains is replacing the poster boards on the footbridge stairs, and in removing the old ones has uncovered some historic late '70s / early '80s ones underneath. They're very well preserved. 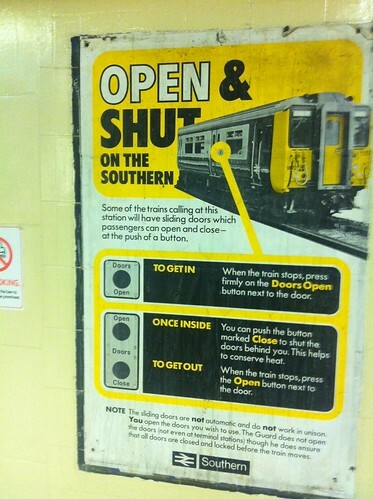 One is a stylised advert for sleeper trains, but my favourite is the one instructing the good burghers of Richmond how to open train doors with a button!" Love both of them, especially the reminder of the "We're getting there" slogan. Wonder how much longer - getting there takes? Pleased that photos were taken before they were lost forever.